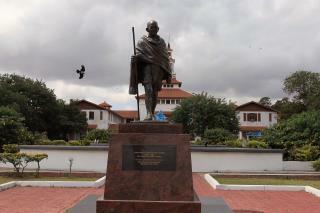 (Newser) – If you think Mahatma Gandhi sounds like just about the least controversial subject for a statue, well, think again. Davis, Calif., unveiled a statue of the champion for non-violent protest Sunday, and fittingly, things started out peaceful. Then dozens of protesters, some of whom had come from hours away, arrived. "They would like to perpetuate this Hollywood version of Gandhi so you (do not) pay attention to the fact that Americans here are supporting the brutalization of minorities back in India," one protester told KCRA. Added another, "I don't understand why America is supporting him when America stands for freedom and Gandhi is not the ideal person for freedom." The statue was a gift from the Indian government and was unveiled on Gandhi's birthday, the UN's International Day of Non-Violence, the Sacramento Bee reports. So what? So is the Vatican.